Seven, or as it is called Se7en, is the reason that we saw a rise in serial killer movies in the mid to late 90's. Its not the movie's or the filmmakers fault. They made a damn fine movie that still holds a punch fifteen years after its release. It is the fault of the studios, who saw an opportunity to cash in a Seven's success. Hollywood has always been a place where, if an idea is a hit, that idea is run into the ground by all of the other people trying to cash in on that movies success. Just look at some of the movies that we have gotten over the years. In 1997 we had two volcano movies, Dante's Peak and Volcano. In 1998 we had two asteroid movies, Deep Impact and Armageddon. 1996 saw the rebirth of the slasher genre with Scream so naturally we got a whole bunch of slasher movies. And let's not forget to mention Hollywood's current obsession with remakes. I mention all of these movies and trends because Seven was a trendsetter. Before Seven we got the usual cop-on-the-hunt type movies but they were usually of the by the book variety. You know the movies I am talking about. The cop begins to investigate a seemingly random murder when all of a sudden the killer starts to call the cop, which leads to a cat and mouse game between the cop and the killer. Seven has this same basic premise, but ups the ante by adding well drawn out characters and the fact that we never see the killer actually kill anybody. That last part is key to the movie's success. Usually we see the killer off a few victims, but here we only see the aftermath of the crime. In fact, we don't even know who the killer is until late in the movie. The reveal of the killer is done with class. It is not done in the "hey, HE'S the killer" fashion. John Doe, as he calls himself, just walks into the police station and turns himself in. That's a pretty ballsy move, but it is just part of his overall plan. As I stated before, the movie has well drawn out characters. Somerset (Morgan Freeman) is seven days from retirement, but chooses to see this case through because he has never seen anything like this before. Mills (Brad Pitt) is not a rookie cop, but has never handled a case like this before either. These two cops develop a working relationship, but not in the usual cop buddy movie manner. They just want to see the case through before they go their separate ways. Gwenyth Paltrow is given the thankless job of being Mills' wife, but the movie throws us a curveball when she shares a very powerful scene with Freeman. Seven has a dark and moody look that reminds us of old film noir movies. There is a lot of shadow play here and it never seems to stop raining, except towards the end. Whenever the cops discover a body it is usually dark, so the cops have to use flashlights. Even when the cops go to library the setting is dark with little light. Now I know that most of you have seen Seven so you know about the ending. Many critics have applauded the ending for being original and daring. I have no doubts about this. It is a very daring ending for a Hollywood movie, but I wish that it went even further. Without giving anything away, I will just say that I wish the filmmakers had looked at what John Doe was really doing and had acted accordingly. They do in a way, but I wish that one character had held back and another character had been a little more forceful. When you see it you will know what I am talking about. I love Seven. It is one of the best movies to come out of the 90's and fully cemented that Morgan Freeman could be a badass by thinking before he acts. He is one of the very few actors who can get that across without doing much of anything. 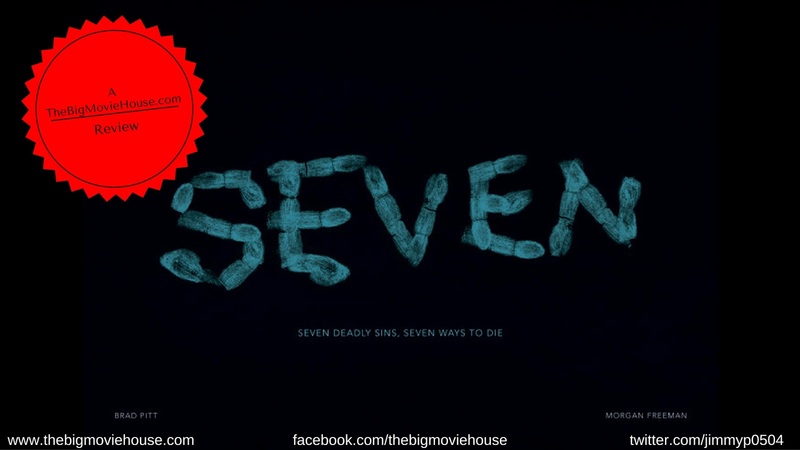 Seven belongs amongst the greatest movies ever made.